One day at the end of January I dreamed of being somewhere deliciously calm and expansive. I would dream of being there, sink back into deeper sleep, then rise to dream-level sleep and enjoy dreaming it again. Sinking back to deeper sleep, rising to savor this peaceful place, I re-dreamed it over and over again. I dreamed it so many times I was sure I’d remember it. But the minute I actually awoke I couldn’t go back there again. The sense of vastness reminded me of being in the sacred landscape of Ireland, my spiritual homeland. That myth-saturated, spirit-permeated landscape has the quality of the dream world. Being in Ireland has the quality of dreaming. Remembering being there is like remembering a dream. Perhaps this dream was suggesting that I need to re-enter the Irish landscape’s dream, the spiritual reality of it, for guidance. I’ve had many, many dreams there. Each one seems meant to be sunk back into and explored, written about, drawn, or danced like a dream, so as to absorb the felt-sense and healing quality of these dreamscapes. Doing daily ritual practices using the Irish elements (feathers, stones, water from holy wells, candle lit from Brigid’s flame) that we bring home with us has helped me stay closer to the dream world of Ireland. Otherwise I tend to wake and remember it as a material place filled with factual experiences. When I don’t do this practice that connects me to that sacred land, the veil between this world and that spirit-world portal starts to close. Each wild, natural community of plants and animals at home here in North Carolina that we pilgrimage to also has the quality of being a sacred landscape. I sink back into the memory of them in order to write or draw their stories, expressing my love for the presences of each of these unique and beautiful habitats. Yes, each of these sacred places is a heartscape. I’ve often thought that it is love that does the drawing and the writing. These compositions cannot be made through a thought process. Experiencing these sacred places and expressing my response to them is a love process. Once, at New Year’s, I experienced loving the spiritual quality of the South Carolina coastal landscape, the dreaming quality of our moving though that liminal landscape at that liminal time. Love wrote the story of that waking dream. A recent Shrine Dream was about Earth’s landscape as a dreamscape, the creative process as being like a shrine rising out of that sacred dreaming landscape, to honor it. A dream is an object; the dreaming is a process. A landscape can be perceived as a collection of objects (plants, animals, rocks), but the dreaming is the process of the flow of energy between them. When we visit a beloved landscape, love energy moves around and between us and our fellow creatures. Earth provides an abundance of dreaming landscapes to intimately connect with. When we attune to Earth’s dreaming, there are endless stories for these landscapes to tell us, both the places that are close to where we live and the ones that are far away. This process is a love process. Love for the soul of the natural community creates the habitat-honoring drawings. Love for the landscape’s dreaming quality is what does the creating. Love for our coast is what I will seek during our yearly Valentine’s Day healing time at the ocean with the dolphins and the water birds, especially those love birds that mate for life — the ducks, swans, and geese. They fly here together from the Arctic, winter after winter. Soon, spring will call them to fly north together again to mate and nurture their newborn lives. Perhaps the landscape of the dream is actually the territory of the creative process itself. The creative process is often experienced as a deep, calm, vast space and vast time, the no-time of the present moment, a state of freedom, a state of play. Gazing at this void, we can lovingly ask our potent questions and scan with alert, yet diffuse, attention for answering possibilities to arise. Love within opens to guidance from without. When I feel love-for, I am in a state of goodness within, so there’s confidence in asking and being alert for answers to appear. Accompanied by a sense of goodness all around, there’s trust in receiving. Goodness is love-substance. Good within and good all around, self-confidence within and trust all around; this is the sense of the flow of energy that Celtic Christianity is imbued with. This love process between All is what Sufis call Ishk. I recently read about a pilgrimage to a dargah, the shrine of a Sufi saint. The landscape surrounding it was referred to as a “sacredscape.” My dream was about being in and returning again and again to a sacredscape, the heartscape, that is the Reality of Love. Perhaps you will consider sharing your earth-dreams, your dreams of the Earth, she who dreams us. She is inviting us to dream with her, to dream for her, and to share our love for her. Dear ones, we have been awake, talking, for long enough. Let’s drift back down and dream together. Take a moment to call to mind a place in nature that soothes your soul. Let it expand out beyond your frame of vision, vastly, in all directions. Now see that same immensity inside you, the measureless expanse of your love. 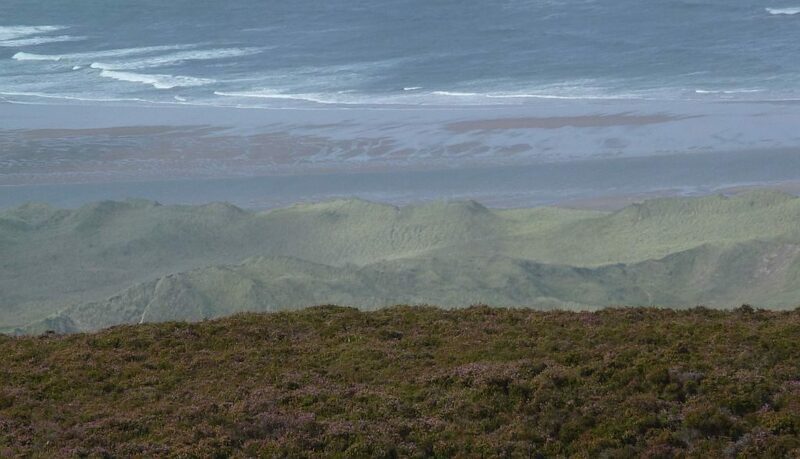 Photo was taken looking down on the marram grass-covered sand dunes and sea from on top of heather-covered Knocknarea, site of Queen Maeve’s tomb, Sligo, Ireland. See New Year’s Story here. Thank you Betty Lou. Reading this has brought me to a very calm expanded place. And the best part, is the realization is that this state of awareness is always present, if I have the intention to access it. Yes, Vrinda, let’s remind each other! Beloved Betty Lou, this writing, intimate and strong, draws me right into your heart, the ‘way’ of you, and touches me deeply. I know this experience also, for me evoked on the prairies in North Dakota. Whereas you connect tenderly with the earth medicine, I am a sky lover. Only this summer, after living in NC for ten years, I moved to a smaller house on the edge of a pasture with a western sky, and think I may not be able to connect to nature spirits here in NC. I am in love with this pasture, friends with its cows, hawk, donkey, deer, fox, white egret, etc. Yet not observant by nature, my connection is more spiritual than earthly. I hope sometime you might come meditate with me here and see what shared vision we might have. Sharon, I knew you meant “now,” and I smiled. 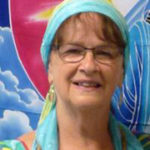 Sharon, I would love to come meditate with you at your pasture and invite vision! Let’s. I’m glad I persevered and found this writing. It is very beautiful–beginning with the photograph (or maybe it’s a collage?) so evocative of the interflow of sea, land, sky. Your language is so evocative: “heartscape,” “dreamscape,” and “love writing” as well as the Sufi “Ishk” all help us name that quintessence you suggest is there, everywhere, if we have eyes to see, ears to hear, hearts to receive. Thank you for this quiet calming in a beautiful but already very busy North Carolina spring morning. It is a companioning joy! Well, Nancy, nothing much is missed being received by your big heart. Congratulations on the publication of your brand new book! Betty Lou, Thank you for reminding me of these things — the way you write about them wakes up my capacity to dream, which sometimes i forget to do. Thank you for this beautiful writing………….. Yes, Barb, let’s all use our capacity, as you say, to dream for the Earth.